In April, Scott Creative had the pleasure of working with Fox Run Golf Club (Council Bluffs, IA) on a redesign of their Golf Outing & Event Menu. Greg G., General Manager for Fox Run, contacted me about making changes to a design that the club had been using for several years. Greg had seen the work Scott Creative had done for Oakwood Country Club (Kansas City, MO) and was hoping I could help him with his design needs. Greg had several changes to the menu, such as item and pricing information, but beyond those changes, Greg was looking for an attractive piece that would echo all that Fox Run has to offer. This new design highlights several new menu items, photos of the course, clean typography and strong branding of the club. The finished size is 8.5″ x 5.5″, scored and folded and was printed on 65# gloss cover. In August, work was completed on a secondary print piece, a Wedding & Banquet Menu (below). This 12-page booklet includes information on the club’s policies, rental rates, dining options and testimonials from couples that have held events there in the past. The layout includes several photos of the clubhouse and grounds, room setups and meals. The finished size of this piece is 8.5″ x 5.5″, scored and folded, printed on 65# gloss cover. The front page of the Oakwood bridal packet. Over the last year, I’ve helped client Oakwood Country Club with several of their monthly newsletters, direct mail pieces, print advertisements and trade show displays. In early November, 2011, Scott Creative designed of a bridal packet for the club’s ongoing marketing needs. This marketing piece provides more information on what this historic country club in the Kansas City area has to offer families in search of a venue for a wedding. An interior page from the Oakwood bridal packet. 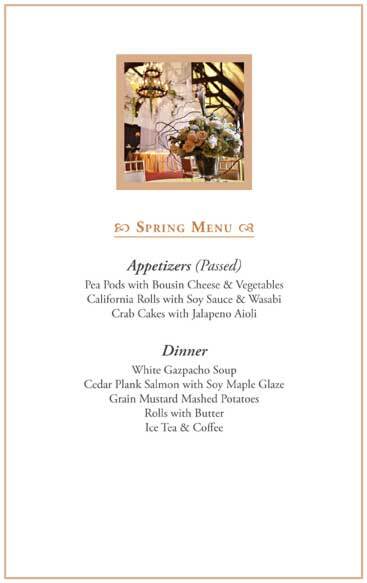 Complete with photos of previous engagements that show options for both outdoor and indoor receptions, the tastefully-designed packet is complete with more information on seasonal menu and buffet options, as well as more information on the venue. Eight pages in total, the full-color booklet folds to a finished, half-letter size (5.5″ x 8.5″) and was completed within a week of the staff’s request. For several months, Scott Creative has been assisting Oakwood Country Club (Kansas City, Missouri) with their marketing and communications needs. My work for this client includes trade show banner designs, print advertisements and now, their club newsletter. In June 2011, I began evaluating their newsletter and identifying areas of improvement in this vital piece of communication. What I learned from conversations with general manager, Chris B., is that what Oakwood needed was a monthly newsletter with a professional feel that engaged their members. Once a new design template was approved, work on the July 2011 was underway. My wife, Sarah (S. Scott Photography) and I traveled to Kansas City to shoot staff photos for the newsletter, as well as photos of the course, clubhouse and surroundings for use in future marketing/communications materials. This new design is intended to help Oakwood connect and communicate with their club’s members in a way the previous version was unable to. A clean, three-column layout includes staff articles accompanied by photos, information on upcoming events, photo galleries of previous events and a monthly calendar. Printed on tabloid size paper, the newsletter is saddle stitched, folded and then mailed to Oakwood Country Club’s members. In January 2011, we were excited to bring on another client, Oakwood Country Club (Kansas City, Missouri). Chris Bancroft, General Manager at Oakwood Country Club, has worked with us previously during his stay at Ironwood Golf Club & Banquet Facility (Omaha, Nebraska). During his time at Ironwood, our work with the Chris included designing a direct mail campaigns targeting executives and families, publishing the club’s monthly newsletter and assisting the club with additional branding & collateral. Our first project with Oakwood consisted of designing the artwork for two banners the club intends to use at The Perfect Wedding Guide’s Spring Bridal Show February 13, 2011. The purpose of these two banners is to communicate two messages to trade show attendees: (i) Oakwood is a historic wedding venue (they have hosted weddings since 1912) and (ii) with a uniqueness all its own, Oakwood is Kansas City’s premiere wedding venue. We worked closely with Chris to correctly and creatively communicate Oakwood’s message through both text and imagery. This included coordinating with VanDeusen Photography (Kansas City, Missouri), who graciously provided some beautiful photos from a previous wedding at the venue, and overseeing printing/production with trade show display specialist, Hamilton Color Lab (Omaha, Nebraska). The banners are approximately seven feet tall and utilize an affordable, retractable system that allows each banner to be set up and transported with ease.